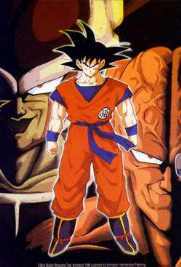 A RARE PIC FROM THE NEW SERIES DRAGON BALL AF, THIS DEPICTS GOKU JR. IN HIS SUPER SAIYIJIN LEVEL 5 FORM. ~*SPECIAL FEATURE*~ I HAVE FOUND IT! ALL OF YOU WHO WANT TO WATCH A 2-3 MINUTE VERSION OF THE CELL GAME STORY INSTEAD OF WATCHING ALL 15 EPISODES OR HOWEVER MANY IT IS, I HAVE THE PERFECT ANIMATED GIF FOR YOU ITS RIGHT ABOVE VEGITA AND 19 FIGHTING HERE ON THE HOME PAGE! PLEASE TAKE A FEW SECONDS TO CLICK ON MY SPONSOR BANNER FOR POGO.COM TO KEEP THIS SITE RUNNING AND FREE! YOU CAN NOW SEND YOUR DECK IDEAS TO ME! INCLUDE YOUR NAME, HOME STATE AND CITY, AGE, CARD LISTING AND QUANITY, AND NAME OF YOU DECK. THE FORM WILL BE ON THE CARD GAME PAGE. the new card game only pics page will be here soon. im nowhere near done with the bios, all 515 of them. but i am also adding some neat flash cards from the official dbz site, so there will be more to view, and they will also act as data sources, and much more, believe me, theyre fun! now keep going through the site and dont forget to vote for me! still working, its hard with such limited comp access. but itll all be done by september, ok? if you have any fav links, or u see sumpin i may have took from ur site, or u have some fanart, email them to me! anything at all! new stuff is still coming in spurts, a few new gifs, new pics, a couple new sections, etc., so keep coming back! :) and keep voting!